Maybe outside the walls of the Big House, you're just a regular joe. But inside... that's another story. Inside you have respect. You run the house, and you don't take attitude from anybody. But since annoying "rules" and "policies" prevent you from wearing your jailhouse duds outside of work, you often feel like no one really knows the true you. Luckily, we have an alternative that will let you show everyone who you are on the "inside." This Men's Prison Guard Shirt is a simple and authoritative solution to your problem... and best of all, when you wear it, there'll be no doubt who's really in charge! Made to look just like the uniform of a jailhouse guard or prison CO, this shirt perfectly captures the unmistakable look of authority. It's made in the stern button-down style preferred by lawmen everywhere, has a classic wing collar, and dark epaulets with matching pocket flaps. And just in case anyone isn't completely clear on who they're dealing with, a "prison guard" logo on the left breast ought to make it pretty obvious. With this clean and neat button-down, you'll finally look like an imposing authority figure in the civilian world, and you won't have to worry about being seen wearing your real uniform off-duty! 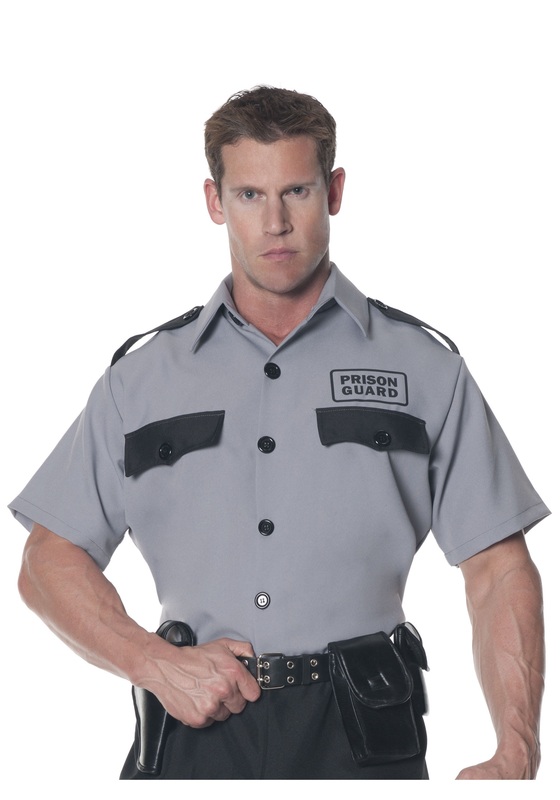 Of course, this awesome Men's Prison Guard Shirt also makes a great Halloween costume for civilians who want a taste of the prison life... without having to try on orange duds. Of course, if you have any friends on the other side of the law who want to play dress-up with you, we sell orange inmate costumes, too!